This All-Female Festival Will End Techno Sexism—Forever! It’s hard for women in man-dominated fields like electronic music to get an equal amount of respect, attention and credit as their male counterparts—especially when their struggles are belittled and doubted by promoters, fans and colleagues. Collectives like Discwoman and female:pressure (as well as countless solo activists) have attempted to balance this dynamic with all or mostly female lineups, which draw attention to the dearth of female names on global festival and club bills. 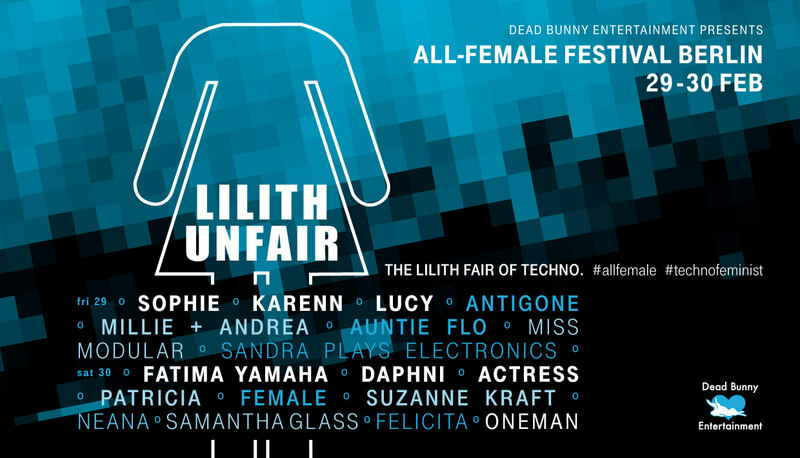 The biggest such techno-feminist bonanza to take place in the world’s underground-clubbing capital, Berlin, joins the cause with Lilith Unfair, a festival devoted to promoting visibility for women in electronic music by stacking the program with womens’ names (and one token dude, just to reverse the usual dynamic). The lineup features some of the most famous girl names in the business, including PC Music delegate Sophie, abstract techno producer Actress and Daphni, an alias of renowned indie-dance producer Caribou (no, not DAPHNE, the mythological naiad and namesake of Smart Bar’s 2015 female-fronted event series). Of course, not everyone agrees on the value and effectiveness of all or mostly female lineups: we’ve debated and considered the issue in an interview with The Black Madonna, a monologue from Berlin promoter Kaltès and a sizeable feature on the topic with words from about a dozen other women who DJ, promote and/or produce. However, we think it’s pretty undeniable that this is just an amazing opportunity for women who DJ. Wow!